Founded as a cooperative venture by several chains in Philadelphia by 1918. Eventually converted most stores to the ACME brand. 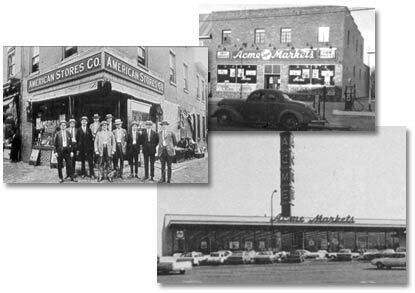 Merged with Alpha Beta Stores in 1961 and Skaggs Stores in 1979. Later acquisitions included Jewel Stores and Osco Drugs (1984), Sav-on Drugs, and Lucky Stores (1988). Many Southern California Alpha Beta stores sold to Ralphs in late 1980s, with some rebranded as Lucky. Company ceased to exist upon its acquisition by Albertsons in 1999, although ACME, Jewel, and Osco retain their names as separate divisions. Later stores were called Robinson & Crawford, at least for a time. They merged with four other grocery chains in 1917 to become the largest retail food distributor in the history of the world, according to the press at that time. The Acme banner was born in the late 1930’s in New Jersey, when Acme Markets opened two of the very first self-service supermarkets. Many more would follow. Acme Markets has prevailed despite a history marked by fierce competition in the East. By successfully navigating through rough waters and a changing business climate, Acme remains the dominant food and drug retailer in the Greater Philadelphia marketplace. In 2000, Acme and Albertson’s joined forces! With this merger we are 2,400 stores strong in 38 states with over 200,000 associates. By the year 2003 (a five year plan) we plan on being 3,300 neighborhood stores strong. We are industry leaders with limitless possibilities!